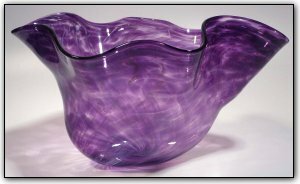 This uniquely shaped fluted vessel can function as either a tall bowl or a wide vase, and features many shades of beautiful and luscious purples with very subtle white/clear accents swirling throughout. Make sure to zoom in and see just how vivid and luscious the colors are, and the way the various shades interact with each other. And with its truly one-of-a-kind shape, this unique piece of glass is sure to get many compliments wherever it is displayed!